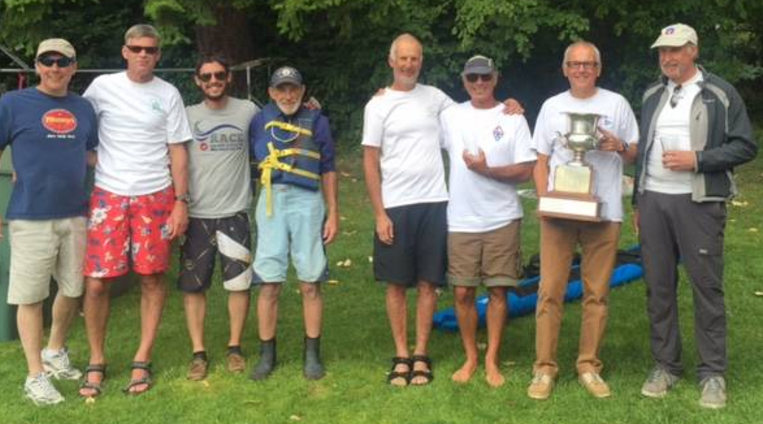 This year was the second time that the C15 North American Championship was held on Lake Washington, hosted by the Beaux Arts Racing Fleet (a.k.a. BARF). Aaron Sharp, our host, weighed all the local boats ahead of time so we had a great head start. The local fleet races every Wednesday evening so it was only fitting that Aaron tried out the mark setting that was planned for the following Friday near the Beaux Arts Shoreline. With the dropped marks, a nice square line was possible instead of the usual start line that is off the dock. That trial run worked out perfect and Aaron was ready to set the Friday course. Unfortunately, he had to give up his spot on Chandler’s boat to run the mark set boat instead of racing. Charlie Quest and John Eurich towed a double decked trailer up from Half Moon bay in one long overnight drive and made their wayto Beaux Arts on Wednesday afternoon. The next day, wanting to pick up the top boat “1st in Class” from the top of the trailer, nobody was around to help with the heavy lifting. That was not going to stop Charlie so he resorted to sink the whole trailer to float the top boat! It is more than remarkable to see hull #1 (built in 1967) on the water racing competitively. Charlie received a call from the owner who needed to part with his boat #1. Charlie took it home to Half Moon Bay. It would have been a shame to let this piece of history go down quietly. I was fortunate to have Kara Carlson let me sail her boat (3638) since she was out of town. Kara’s boat is in very good condition very similar to my boat in Marina del Rey so I was looking forward to a great weekend of racing. Leading up to Friday, the weather threatened to deliver a very very light breeze – 4 knots – but in the end we were able to make the best of it. The breeze was decent enough for racing. 9 boats were on the start line at 1:00 and Susan Bogert who was the PRO on Friday was able to give us 8 races for the Syd Corp Series qualifier. Forrest Kulp in his “lean” running rig was at his best (isn’t he always?) as he easily won the series with seven 2nd place and one 1st place. Forrest’s boat is always fast in light air and clearly, growing up on this spot of Lake Washington, he put to good use his local knowledge for when to go for the shore or the middle of the lake. His driving is simply amazing. We had different plans for Saturday and Sunday as we wanted to sail further north on Lake Washington in hope of better breezes. The sailing Foundation which promotes youth Sailing in the Northwest provided all of the infrastructure to run great races. We were able to get a professional PRO (Andrew Nelson) who teamed up with his wife Ashley to lay the courses, supported by 2 really fast RIBs. Saturday we also had a second fleet (4 Etchells and one J33) that shared the course with us. The day started with a postponement because the breeze was not established and was so light some boats could not get there in time for the 11:00 start. Once we got under way, we got several races where the Etchells went to the far mark but met the C15s at the leeward mark, which made for some difficult mark roundings for those that got caught navigating around the big boats. The day was punctuated by alternating light breeze and no breeze that seemed synchronized with the passing of clouds. This gave some spectacular situations such as what occurred in the last race of the day where Brian was clear ahead sailing to finish with a nice breeze when the rest of the fleet made it to the leeward mark only to find no wind at all. So we saw at least 8 boats sitting past the leeward mark going absolutely nowhere. All the while, Brian was sailing away to the finish line. Moments later a very gentle pressure came to our rescue, but took the wind off Brian who was only 100 yards from the finish. The rest of the fleet proceeded on and let Brian languish on the right side of the course and ended up last. That was really bad luck. Sel and Michael (3697) who had not sailed on Friday did very well all day in those difficult conditions with three 2nd place and one 1st! At that point, Steve and I had given up any hope of placing well given our lackluster showing on Saturday. Sunday forecast called for light rain in the morning and light breeze again. Things did not look good for us on 3638. On Sunday we woke up to grey skies and a light drizzle. This basically meant no wind. However, the ceiling lifted a bit and by 10:00 we had some hopes for a light breeze. Now, the wind was coming from the south. By the time the RIBs were on the race area, the wind had shifted to the east. After a short postponement, the course was set for East wind, then it clocked to the North, got another race in. A moment later, the breeze freshened up and the course had to be set to West. Some cloud were clearing up which brought some good breeze and saw some boat out on trapeze. That is when our jib halyard lock popped and had trouble pointing. I had never noticed so well what happens to the jib when you sail in dirty air with a limp luff wire: the jib flutters and back fills quickly. That good breeze did not last. On race 8, the breeze had eased up and eventually stopped when I was one boat length away from a 1st place finish but Sel had some momentum and was going to snuff first place from us. After a quick but excruciating tack, we were moving and passed the line ahead of Sel by perhaps 2 feet! All racing was done by 3:30 and we got ready to pack and catch our plane to LAX. Much to our surprise, our score improved enough to tie with Sel for 1st place. That slow finish ended up making the difference! 4 boats raced and were scored as B fleet. While Glen came in last, it was clear that when the breeze picked up he found “a second wind” as boat made up was in her elements like home in Oregon, much more than when it is light and fluky. Karey Sharp with Tom Stowe placed 1st in the Cabrillo fleet. Each day after racing were greeted by Andrea Sharp and her group of volunteers from BARF who showed their legendary hospitality on the beautiful setting of the Beaux Arts shoreline. It was a sight to see and experience with the long evenings when the sun does not set until well past 9:00pm. We must thank The Sailing Foundation and Andrew and Ashley for providing the equipment and their professional expertise. There was a lot of work for that markset boat! Thank you also Aaron and Andrea for making this year NAC run so smoothly. In the end, the breeze was better than feared. We are looking forward to next year’s NAC in Half Moon Bay – August 11,2,13 2017 with John Eurich our new commodore for the C15 association.